There are numerous examples throughout industry where materials analysis is required, be it for process control, effluent monitoring, control of product quality or plant integrity and condition monitoring. Analysis and characterisation is often carried out by removing a sample, transporting it to a suitable laboratory and applying a range of analytical techniques depending upon the nature of the sample and the information required. In many cases there is a need to establish the elemental make-up of a material, for example grade determination of steel components prior to weld repair, measurement of the chromium content of steel tubes to help assess the susceptibility to wear-enhanced corrosion, identification of materials as part of waste processing and segregation etc. The removal of physical samples of the materials is, however, time-consuming, costly and, in cases where large numbers of samples are required, not practical or at least problematic from Quality Assurance point of view. Removal of samples can also create additional problems through the generation of secondary wastes. Furthermore, sample removal can, in many cases, compromise the mechanical strength and integrity of the component under examination. The advantages of in-situ analysis of materials are, therefore, significant in many applications. Unfortunately, there are only a very limited number of techniques that are suitable for in-situ elemental analysis of materials. Portable X-Ray Fluorescence (XRF) instruments and Electrical Spark Spectrometer instruments offer well-proven and commercially available technology for in-situ materials analysis. These types of instrument, however, are bulky and are generally not practical in situations where physical access to the material is limited. Within the nuclear industry, there are many cases where the material of interest is itself radioactive or the local environment is particularly hostile due to high levels of radiation, physical access limitations, high temperatures or highly corrosive chemicals. Currently available instruments for in-situ analysis are entirely unsuitable for the majority of these environments, the only viable option being sample removal and laboratory analysis. Recently, however, a novel instrument based on a technique known as Laser-Induced Breakdown Spectroscopy (LIBS) has been developed to perform remote and in-situ elemental analysis of materials and which is able to operate in these hostile environments. LIBS is a form of atomic emission spectroscopy (AES) and is capable of identifying the constituent elements of a wide range of materials irrespective of the physical state (ie. solid, liquid and gas). The basic principle behind LIBS is illustrated schematically in figure 1. The output of a pulsed laser is focused on to the sample material so that a luminous microplasma or spark is produced on the surface. A tiny amount of the sample is ablated from the surface and is dissociated into ionic and atomic species within the highly ionised plasma. At the end of the laser pulse, the plasma cools and these species emit light of characteristic wavelengths. A fraction of this light is collected and analysed by a purpose-designed optical detection system integrated with the laser. The instrument is computer controlled and the results of the measurement are displayed on the computer screen within a few seconds. Although the peak power of the laser is very high (in the megawatt range), the average power is typically less than 1 Watt. This means that the laser interaction with the sample is nearly non-thermal, i.e. no increase in sample temperature, resulting in virtually no damage to the material. The LIBS technique, therefore, may be regarded as quasi non-destructive. For remote analysis applications, there are two basic types of LIBS instrument differing only by the method of delivery and collection of the laser and plasma light respectively. One method uses an optical-fibre probe configuration and is suited to applications where access to the material is possible only via a convoluted route. The other method uses an optical telescope arrangement and is suited to applications where there is line-of-sight access to the material. A Q-switched Nd:YAG laser producing a pulsed output of wavelength 1064nm (infra-red), pulse duration ~10ns and pulse repetition rate of between 1 and 20Hz is used as the ablation laser. Pulse energies in the range 5mJ to 20mJ are usually adequate for most applications. The laser is compact, portable and requires only a single phase 240 Volt, 13 Amp supply. The exact specification of the optical spectrograph depends on the requirements of the particular application (eg. resolution, wavelength range, size and cost). An industrial portable computer is linked to the laser, delay generator and spectrograph and is used to acquire and analyse the digitised spectra. The laser-induced plasma has a lifetime of approximately 20ms, which is significantly longer than the laser pulse duration. After the laser pulse, the highly luminous plasma rapidly expands and cools. Time-gated detection of the plasma light makes it possible to record spectra with strong atomic emission lines and relatively low background, considerably enhancing the signal-to-noise ratio. The detector delay time is very important to the LIBS technique and needs to be optimised for each type of measurement and application. In practice, the optimum delay time depends upon the physical state and type of material / analyte combination and on the measurement conditions (ie. laser energy, focusing conditions). A lifetime review for Hunterston B and Hinkley Point B AGR stations identified superheater bifurcation cracking as a commercial threat to 35-year operation of the boiler plant. Inspection of all 528 bifurcations in each reactor was required in order to identify the components that were at risk of failure prior to the end of station life. The material properties of the bifurcation casts are primary factors in determining the risk of an individual component failing. A survey of the boiler manufacturing case history identified a number of casts having low creep ductility properties leading to an increased risk of the component failing within the remaining operating life of the stations. The location of these low creep ductility casts within the population of 2112 bifurcations was, unfortunately, not known. An in-vessel materials analysis technique able to quickly identify the location of the affected bifurcations was required so that further inspection techniques and repair procedures could be targeted where necessary. This strategy would help to significantly reduce the time needed to identify the bifurcations most at risk of failure and, as required by ALARP, would reduce dose uptake of the in-vessel personnel needed to carry out the inspection work. It was known that the low creep ductility casts exhibit abnormally high copper content in comparison to other 316H stainless-steel casts used for bifurcation manufacture. In-vessel measurements of the copper content of the bifurcations could, therefore, be used to identify these casts. As shown schematically in figure 2, the instrument consists of a Q-Switched Nd:YAG laser, an optical spectrograph, a computer, a 75 metre umbilical containing the optical-fibres and a pneumatically operated probe. The probe, illustrated in figure 3, contains the lens system used to focus the laser light onto the surface of the steam tube. The optical fibre is used to transmit the laser light to the probe and to transmit the plasma light back to the spectrograph. A fibre umbilical of 75 metres was used so that only the umbilical and probe were deployed in the vessel, with the remainder of the equipment situated above the pile cap. The modular and multiply redundant design of the instrument helped to reduce the risk of down-time due to component failure. A number of safety features were incorporated in the design of the instrument making it impossible to activate the laser system unless the probe was correctly attached to the bifurcation. The LIBS instrument is located in a safe area above the pile cap (figure 4) and the umbilical is fed into the vessel via the man-access route and deployed inside one of the twelve superheaters. The length of the umbilical was sufficient to reach any of the 528 bifurcations (44 per superheater). 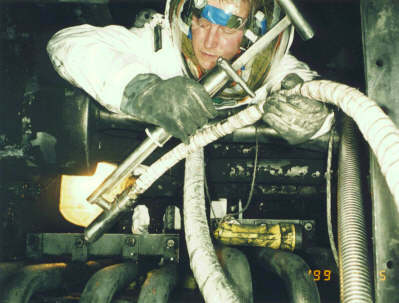 Conditions inside the vessel are extreme (figure 5); relatively high radiation fields, temperatures of approximately 60oC, limited physical access and confined space working. The in-vessel probe operator attaches the probe to a bifurcation and, via the voice communication link, informs the instrument operator that a measurement can commence. Each measurement takes approximately 3 minutes during which time the data is analysed by the computer and the results displayed on the monitor. The recorded spectra and other relevant data are stored on the hard disk of the computer for further analysis if required. In-situ analysis of AGR superheater bifurcation materials has been achieved using a novel design fibre-probe LIBS instrument. Semi- quantitative measurements of the copper concentration of each component were recorded and used to establish which of the 528 bifurcations were manufactured from low creep ductility material. The measurement time per bifurcation was typically less than 3 minutes, allowing a complete superheater to be examined within two vessel entry periods. Periodic in-vessel calibration of the LIBS instrument provided confirmation that the instrument was functioning correctly. The results of a laboratory analysis of a sample of a faulty bifurcation removed from the vessel were in good agreement with the measurement results produced by the LIBS instrument. This is the first recorded case of a LIBS instrument being used to carry out in-situ analysis of materials at a distance of 75 metres. The technology has the potential to offer significant advantages over existing materials analysis techniques, especially for applications involving hazardous materials or environments. Other types of LIBS instrument currently being developed by Applied Photonics Ltd for various applications include remote analysis of HA waste, radioactive liquids, molten glass, Pu/U materials and in-situ characterisation of fuel containing materials within decommissioning waste.